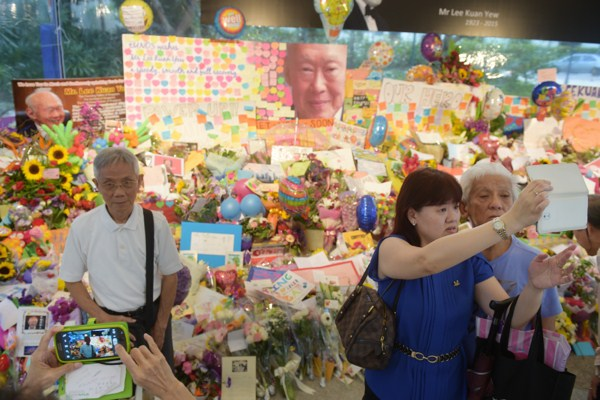 Visitors take pictures of themselves in an area set aside for tributes to former Singapore Prime Minister Lee Kuan Yew at the hospital where he passed away, Singapore, March 23, 2015 (AP photo by Joseph Nair). Singapore’s founding prime minister, Lee Kuan Yew, transformed the island from a tiny third-world country in 1965 into a first-world city-state that is now one of the world’s most prosperous, least corrupt and best-educated societies. Yet after Lee’s death earlier this month on the 50th anniversary of the republic’s founding, questions remain about the durability of his legacy. While changes have been afoot in Singapore, particularly since Lee retired from politics in 2011, they are likely to develop into larger challenges as the city-state’s economic constraints become clearer and its politics more competitive amid growing regional and global uncertainties.